The two panels and four stanzas below represent Page 1 of the 2015 Heretical Press comic book edition. By any man or beast. “For you our hearts do bleed! And those were welcomed too. — Of genius they’d no lack. “That stuff is all OLD HAT! “Those hens can’t tell such lies! “To keep them out is bigotry! The old ducks soon did lose. “These chickens have gone mad! A heavy fine must pay! “’Twill put me in a mess! And simply threw them out. 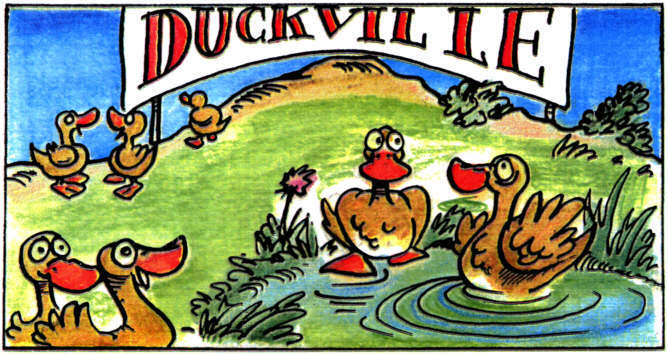 — On Duckville they converged. Was what the hens all urged. “Those geese will stop at naught! They plan to conquer all the world! Those geese have plans to conquer us! The Quack put up its duck. The Mayor said, “Gooseville must go! For Gooseville set a trap. The geese got mad and threw some rocks. Why swans on them turned sour. The young ducks had gone mad. They taught the ducks to crow. — And so ad infinitum!